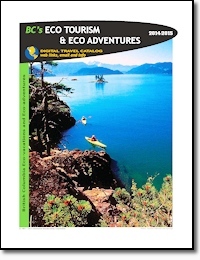 Download a free catalog that focuses on eco-tourism and eco-adventures in British Columbia, Canada. Eco-tourism one of the fastest growing travel sectors, and BC is one of the most beautiful places in the world! An nature-based eco-tourism vacation in British Columbia means unspoiled, pristine wilderness, majestic national and provincial parks, breathtaking vistas, towering mountains, rugged coastline and countless rivers and valleys. In fact, BC is the perfect location for your next eco-adventure. BC Eco-Tourism & Eco-Adventures Catalog showcases the unique nature-based resorts, vacations and adventures of British Columbia, Canada. Sailing, hiking, expeditions, nature tours, wilderness education, wildlife viewing and world class resorts and destinations. BC Eco-Tourism & Eco-Adventures Guide - A part of the BC Adventure Network. BC's largest travel network.